Apricorn Aegis Fortress L3 - Solid state drive - encrypted - 512 GB - external (portable) - USB 3.1 - buffer: 8 MB - 256-bit AES-XTS, FIPS 140-1 Level 3Delivering all of the same next level security features as the Aegis line of secure drives, in an extremely rugged enclosure, and with a new, ultra-fast encryption chipset, the L3 is a very fast, robust, high capacity drive. Tough on the outside, the Fortress L3 is designed to meet NIST's highest level of FIPS validation attainable for portable devices: 140-2 level 3. Small enough to go in a pocket or briefcase, large enough to carry up to 16TB of data, the Fortress L3 allows you to securely and easily carry large amounts of sensitive data everywhere you go. 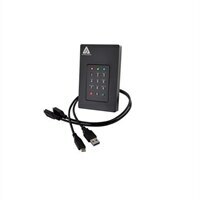 The Aegis Fortress is Software-Free, 100% hardware-based 256-bit AES XTS encrypted, and onboard keypad PIN authenticated with ultra-fast USB 3.1 (3.0) data transfer speeds. All data is encrypted on the fly and all PINs and data remain encrypted while the drive is at rest. Completely cross-platform compatible and OS agnostic; the Aegis Fortress thrives with Windows, Linux, Mac, Android, Symbian and Chrome. It also thrives where software-authenticated encrypted devices cannot function, such as embedded systems and equipment in possession of a powered USB port and storage file system but no keyboard.